Pixel Lantern’s retro platformer Bard’s Gold is out today for the PS Vita and PS4 in North America and Europe digitally via the PlayStation Network with Cross-Buy support. 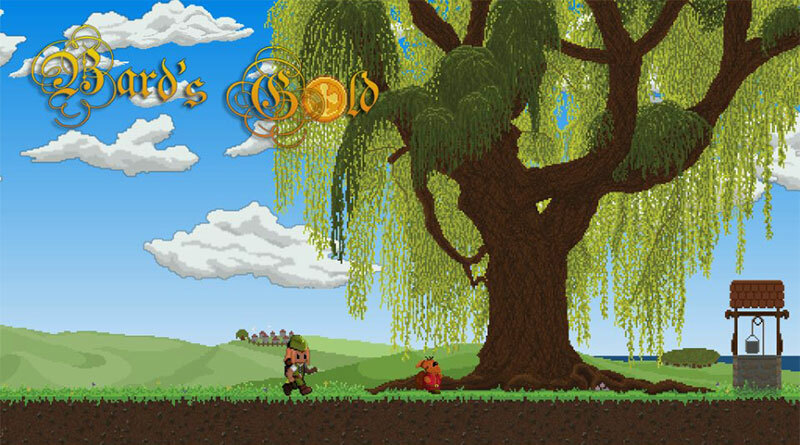 Bard’s Gold is a slow-paced platformer with light RPG elements, where the player has to find the key within the level and get to the door in order to progress through the game. Bard’s Gold is inspired by late ’80s and early ’90s classics such as Rick Dangerous, Alex Kidd in Miracle World, Rainbow Islands, Wonder Boy in Monster World, Erik, and Rodland and features an original soundtrack that perfectly frames the atmosphere, soothes your soul and fills you with confidence as you overcome levels you once thought were unbeatable. Speaking of levels, there are more than 100 of them. All have been handcrafted and are picked randomly for each playthrough. And if that is not enough to keep you playing over and over again, the game features a permanent upgrade system to make each and every one of your sessions count. No tutorials or explanations how things should be done. Everything including the basic game mechanics must be figured out by yourself as you go. Different layouts for each level is randomly chosen every playthrough. While getting the chance to memorize levels and get better at them, the “random level” system will keep your interest. With the gems you collect you will be able to upgrade your character on the Game Over screen. These upgrades are permanent and will help you on future playthroughs.